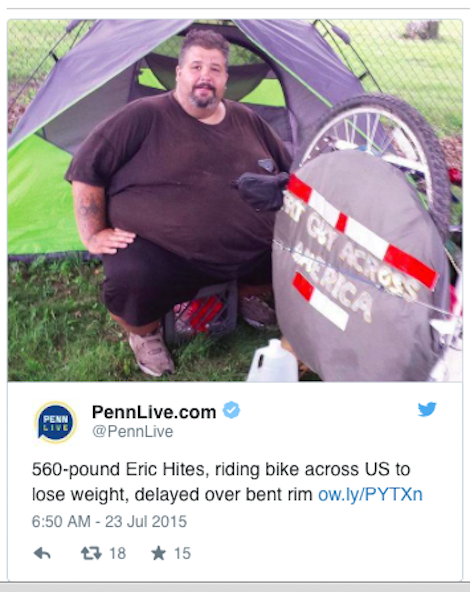 A 560-pound man is riding a bicycle across the United States in an effort to drop hundreds of pounds. The Newport Daily News reports 40-year-old Eric Hites started his journey last month in Falmouth, Massachusetts. He’s gone 90 miles so far and claims to have lost 60 pounds in the first two weeks. “I hit 40 and I said, ‘I’ve got to change this,’” he said. Hites is currently in Tiverton, Rhode Island, due to a bent rim on his bicycle. Rob Purdy of Newport Bicycle is supplying Hites with new mountain bike wheels to support his weight.